Area: 181 sq. km. (about 70 sq. mi.) of land area scattered over 750,000 sq. mi. of the Western Pacific. Cities: Capital: Majuro (pop. 30,000 in 2008). Other towns — Ebeye (12,000), Jaluit (1,700). Terrain: 29 low-lying coral atolls and five single islands. Climate: Tropical with a wet season from May to November. Nationality: Noun and adjective — Marshallese. Population (2009 estimate by RMI Government health ministry): 61,300. (Figures do not include Marshallese in the U.S., who are located primarily in Hawaii, Oregon, California, and Arkansas). Annual population growth rate (2008): 2.14% (due to high annual emigration); RMI Government health ministry reported 2008 birth rate of 4.54%. 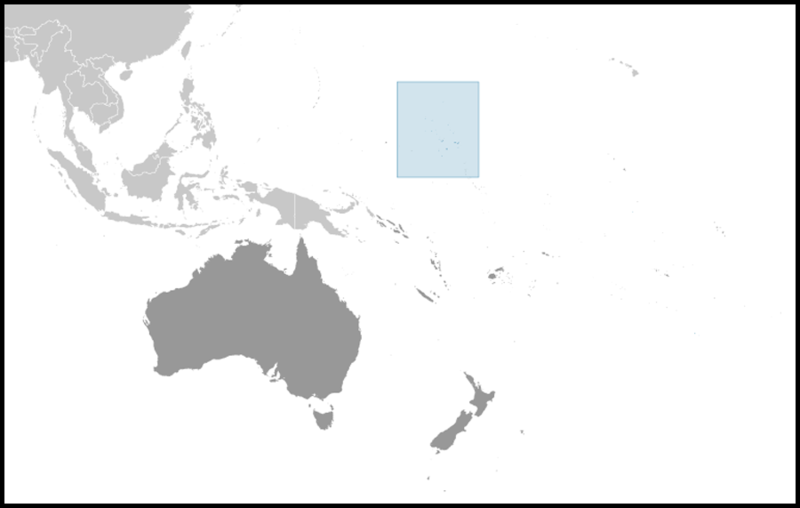 Ethnic groups: 90% Marshallese, 10% estimated U.S., Filipino, Chinese, New Zealander, Australian, other Micronesian (FSM), Kiribati, Korean, and Fijian. Languages: Two major Marshallese dialects from Malayo-Polynesian family; English. Education: Literacy (2002): 98% (officially based on question, "Do you read the bible?"). Health: Infant mortality rate: (2006) 3.0% Majuro and Ebeye, 9.4% on outer atolls. Life expectancy — men 65.7 yrs. ; women 69.4 yrs. Work force (2006) 25,706 of working age: 39% employed, 61% unemployed or inactive. National and local government and government enterprises — 45.9%; private enterprise and non-profits — 41%; USAKA and foreign embassies — 13%. Type: Parliamentary democracy in free association with the U.S. A Compact of Free Association entered into force in 1986 and an Amended Compact entered into force May 1, 2004. Independence: October 21, 1986 from the U.S.-administered UN trusteeship. Branches: Executive: president (chief of state), cabinet. Legislative — unicameral parliament (Nitijela) and consultative Council of Iroij (traditional leaders). Judicial — Supreme Court, high court, district and community courts, traditional rights court. Political parties: United Democratic Party, United People's Party, Aelon Kein Ad (Our Islands) Party. Administrative subdivisions: 24 local governments. GDP (current market prices, 2008 est. ): $161.7 million. Natural resources: Marine resources, including mariculture and possible deep seabed minerals. Agriculture: Products: copra (dried coconut meat) and breadfruit are subsistence crops. Industry: Types: copra processing, fish processing, tourism, pearl farming, handicrafts. Trade: Major trading partners: U.S., Japan, Australia, China, Hong Kong, New Zealand, Taiwan. The Marshall Islands is comprised of 29 atolls and five single islands, which form two parallel groups — the "Ratak" (sunrise) chain and the "Ralik" (sunset) chain. 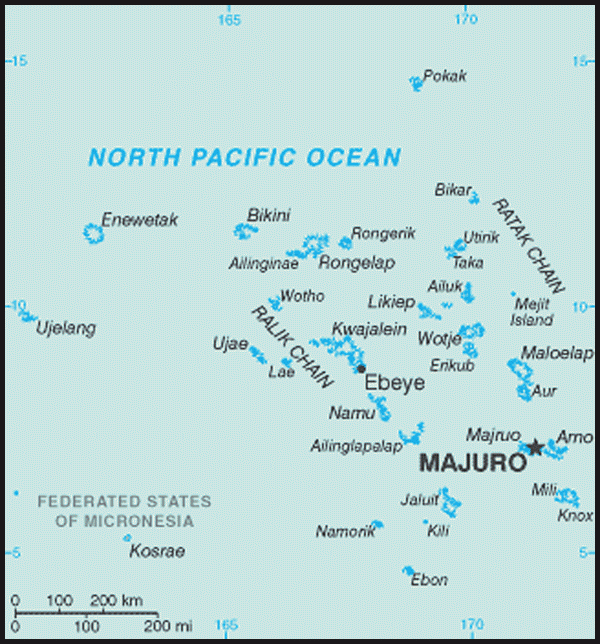 Two-thirds of the nation's population lives in Majuro and Ebeye. The outer islands are sparsely populated due to lack of employment opportunities and economic development. The Marshallese are of Micronesian origin, which is traced to a combination of people who emigrated from Southeast Asia in the remote past. The matrilineal Marshallese culture revolves around a complex system of clans and lineages tied to land ownership. Virtually all Marshallese are Christian, most of them Protestant. Other Christian denominations include Roman Catholic, Seventh-day Adventist, Mormon, Salvation Army, and Jehovah's Witness. Small Bahai, Jewish, and Ahmadiyya Muslim communities also exist. Marshallese is the official language. English is spoken to some extent by most of the adult urban population. However, both the Nitijela (parliament) and national radio use Marshallese. The public school system provides education through grade 12, although admission to secondary school is selective. The elementary program employs a bilingual/bicultural curriculum. English is introduced in the fourth grade. Many Marshallese and American observers have lamented the poor state of the public education system as a major stumbling block to economic development. The Marshall Islands' largest secondary institution — the 2-year College of the Marshall Islands — experienced U.S. accreditation problems between 2003 and 2008. However, thanks to an increase in funding, it has shown steady improvement and has now achieved full accreditation. The University of the South Pacific offers courses at a small campus on Majuro. Specialties taught on campus are marine resources and nursing as well as basic undergraduate education courses. Little is clearly understood about the prehistory of the Marshall Islands. Researchers agree on little more than that successive waves of migratory people from Southeast Asia spread across the Western Pacific about 3,000 years ago and that some of them landed on and remained on these islands. The Spanish explorer de Saavedra landed there in 1529. They were named for English explorer John Marshall, who visited them in 1799. The Marshall Islands were claimed by Spain in 1874. Germany established a protectorate in 1885 and set up trading stations on the islands of Jaluit and Ebon to carry out the flourishing copra (dried coconut meat) trade. Marshallese iroij (high chiefs) continued to rule under indirect colonial German administration. At the beginning of World War I, Japan assumed control of the Marshall Islands. Their headquarters remained at the German center of administration, Jaluit. U.S. Marines and Army troops took control from the Japanese in early 1944, following intense fighting on Kwajalein and Enewetak atolls. In 1947, the United States, as the occupying power, entered into an agreement with the UN Security Council to administer Micronesia, including the Marshall Islands, as the Trust Territory of the Pacific Islands. On May 1, 1979, in recognition of the evolving political status of the Marshall Islands, the United States recognized the constitution of the Marshall Islands and the establishment of the Government of the Republic of the Marshall Islands. The constitution incorporates both American and British constitutional concepts. The legislative branch of the government consists of the Nitijela (parliament) with an advisory council of high chiefs. The Nitijela has 33 members from 24 districts elected for concurrent 4-year terms. Members are called senators. The president is elected by the Nitijela from among its members. Presidents pick cabinet members from among the members of the Nitijela. Amata Kabua was elected as the first president of the republic in 1979. Subsequently, he was re-elected to 4-year terms in 1983, 1987, 1991, and 1996. After Amata Kabua's death in office, his first cousin, Imata Kabua, won a special election in 1997. The third president, Kessai Note, served two 4-year terms from 2000 to 2008. Litokwa Tomeing was elected president in January 2008 and was removed from office in a vote of no confidence in September 2009. Jurelang Zedkaia was elected president in October 2009. New elections are scheduled for November 2011. The Republic of the Marshall Islands has four court systems: The Supreme Court, the high court, the district and community courts, and the traditional rights court. Trial is by jury or judge. Jurisdiction of the traditional rights court is limited to cases involving titles or land rights or other disputes arising from customary law and traditional practice. The Republic of the Marshall Islands maintains an embassy (http://www.rmiembassyus.org/) at 2433 Massachusetts Avenue NW, Washington, DC 20008 (tel. 202-234-5414). It has two consulates in the U.S., one at 1888 Lusitana St., Suite 301, Honolulu, HI 96813 (tel. 808-545-7767) and the other in Springdale, Arkansas. The Marshall Islands also has embassies in Tokyo, Suva, and Taipei. The Marshall Islands' Mission to the United Nations is located at the News Building, 220 E. 42nd St., 31st Floor, New York, NY 10017 (tel. 212-983-3040). Citizens of the Marshall Islands live with a relatively new democratic political system combined with a hierarchical traditional culture. The first two presidents were chiefs. Former President Kessai Note is a commoner. Current President Jurelang Zedkaia is a traditional high chief. There have been a number of local and national elections since the Republic of the Marshall Islands was founded, and, in general, democracy has functioned well. The United Democratic Party, running on a reform platform, won the 1999 parliamentary election, taking control of the presidency and cabinet. Elections on November 19, 2007 elected a new Nitijela that took office in January 2008, giving control of the government to the opposition, while the September 2009 vote of no confidence replaced both parties with a coalition no longer following any party lines. The government is the largest employer, employing 46% of the salaried work force. GDP is derived mainly from payments made by the United States under the terms of the Compact of Free Association. Direct U.S. aid accounted for 61.3% of the Marshall Islands' $137.4 million budget for FY 2010. The economy combines a small subsistence sector and a modern urban sector. Fishing and breadfruit, banana, and pandanus cultivation constitute the subsistence sector. On the outer islands, production of copra and handicrafts provides some cash income. The modern service-oriented economy is located in Majuro and Ebeye. It is sustained by government expenditures and the U.S. Army installation at Kwajalein Atoll. The airfield there also serves as a second hub for international flights. The modern sector consists of wholesale and retail trade; restaurants; banking and insurance; construction, repair, and professional services; fisheries; and copra processing. Fish products are by far the nation's largest exports, with frozen fish being exported on large freezer ships to Asia and fresh caught fish by air to Japan and Hawaii. A tuna loining plant that employs 600 workers — starting at under $2.00 per hour — reopened in early 2008. Copra production, the previous most important single commercial activity for the past 100 years, now depends on government subsidies. The subsidies, more a social policy than an economic strategy, are intended to help reduce migration from outer atolls to densely populated Majuro and Ebeye. Migration from the outer islands is estimated at 8% annually. Marine resources, including fishing, aquaculture, tourism development, and agriculture, are government development priorities. The Marshall Islands sells fishing rights to other nations as a source of income. Since 1990, the Marshall Islands has offered ship registrations under the Marshall Islands flag. It now registers about 2,300 vessels, the third-largest fleet in the world, and receives an income of approximately $4 million annually. As a small nation, the Marshall Islands must import a wide variety of goods, including foodstuffs, consumer goods, machinery, and petroleum products. While the Government of the Marshall Islands is free to conduct its own foreign relations, it does so under the terms of the Compact of Free Association. Since independence, the Republic of the Marshall Islands has established relations with 67 nations, including most other Pacific Island nations. Regional cooperation, through membership in various regional and international organizations, is a key element in its foreign policy. The Marshall Islands became a member of the United Nations in September 1991. The Marshall Islands maintains embassies in the U.S., Fiji, Japan, and Taiwan. The Republic of the Marshall Islands is a sovereign nation in "free association" with the United States. After more than a decade of negotiation, the Marshall Islands and the United States signed the Compact of Free Association on June 25, 1983. The people of the Marshall Islands approved the Compact in a UN-observed plebiscite on September 7, 1983. The U.S. Congress subsequently approved the Compact, adding several amendments which were accepted by the Government of the Marshall Islands, and the Compact entered into force on October 21, 1986. From 1999-2003, the two nations negotiated an Amended Compact that entered into force on May 1, 2004. Under the Amended Compact, the U.S. will provide the Marshall Islands at least $57 million every year until 2023, including contributions to a jointly managed trust fund. Marshallese will continue to have access to many U.S. programs and services. A Joint Economic Management and Financial Accountability Committee (JEMFAC) comprised of representatives of both governments will ensure that Compact assistance funds are spent effectively. Under the Compact, the United States has full authority and responsibility for security and defense of the Marshall Islands, and the Government of the Marshall Islands is obligated to refrain from taking actions that would be incompatible with these security and defense responsibilities. The Department of Defense, under a subsidiary government-to-government agreement of the Compact, has use of the lagoon and several islands on Kwajalein Atoll. The atoll consists of approximately 90 islets around the largest lagoon in the world. The agreement allows the United States continued use of the U.S. Army Kwajalein Atoll (USAKA) missile test range until 2066 with an option until 2086. Another major subsidiary agreement of the original Compact provides for settlement of all claims arising from the U.S. nuclear tests conducted at Bikini and Enewetak Atolls from 1946 to 1958. Under the terms of free association, more than 40 U.S. Government agencies such as the Federal Aviation Administration, the U.S. Postal Service, the Small Business Administration, the U.S. Agency for International Development (USAID), the Department of Energy, the Department of Agriculture, and the Department of the Interior operate programs or render assistance to the Marshall Islands. The United States and the Marshall Islands have full diplomatic relations. The Marshall Islands has expressed an interest in attracting U.S. investment. The U.S. Embassy (http://majuro.usembassy.gov/) in the Marshall Islands is located on Long Island, Majuro (tel. 692-247-4011, fax 692-247-4012). Mailing address: P.O. Box 1379, Majuro, MH 96960-1379.